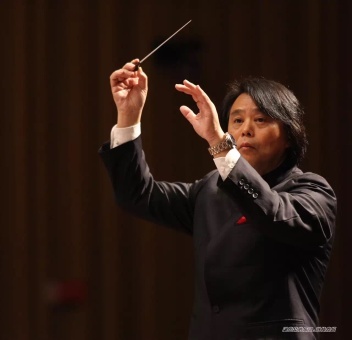 Mr. Xiao Ming, director, chief conductor, and executive president of Hunan Symphony Orchestra, is one of the national first class conductors of China. Mr. Xiao graduated from the Shanghai Conservatory Of Music in 1984 and Central Conservatory of Music in 1988, majoring in orchestral conducting. Mr. Xiao’s incumbent titles include: the head of the Hunan Symphony Orchestra, member of Chinese Symphony Association, Hunan Province Artists Association vice chairman, President of the Hunan provincial Wind Instrument Association, and adjunct professor of Central South University and Hunan Normal University. He was awarded the “Hunan province ‘DeYiShuangXin’ artists” and “outstanding experts” title by the Chinese Ministry of culture. He is the guest conductor of China Dance Theater Symphony Orchestra, Tianjin Symphony Orchestra, Henan song and dance theater Symphony Orchestra, Wuhan Symphony Orchestra, Qingdao Symphony Orchestra, and Xinjiang Philharmonic Orchestra. In 1988 Xiao conducted his debut at the Beijing Concert Hall with the Chinese Radio Symphony Orchestra (predecessor of the Chinese Philharmonic). Mr. Xiao has also been invited to be guest conductor in the U.S. and had great success conducting Washington Andeni Symphony Orchestra, San Francisco Symphony, and the Madison Symphony Orchestra. The local reviews of his concerts are all positive; one of them describing him as “so wonderful to work with.” Other invitations include the China Dance Theater Symphony Orchestra, Chamber Orchestra, Central Conservatory of Music, Tianjin Symphony Orchestra, Henan Song and Dance Theater Symphony Orchestra, Wuhan Symphony Orchestra, and Qingdao Symphony Orchestra. In December 2006, as the conductor of the Hunan Symphony Orchestra, Mr. Xiao performed “Xiaoxiang Rhyme Chinese Love” Symphony Concert in Australia. In May 2008, he took the Hunan Symphony Orchestra to Beijing to participate in the "First Chinese Spring Symphony”, they performed "Long Island Song" symphony concert at the National Grand Theatre. In March 2010, the Hunan Symphony Orchestra performed in the Taipei music hall “Xiaoxiang Rhyme Feeling On Both Sides” symphony concert, the first concert from mainland China featured in the Taipei music hall of Taiwan. In June 2011, the Hunan Symphony Orchestra traveled to Henan to attend the third session of Chinese Symphonic Music and China Works Exhibition Concerts and achieved great success. In January 2013, he performed in the Austria Vienna Chinese Art Festival, and won the “outstanding directing prize”.